The Mustard Seed, Inc. is a non-profit, Roman Catholic organization in Iowa City, Iowa. It is our goal to make available the teachings of the Catholic Church through the sale of select Catholic books, gifts, artwork, videos, and audio products. 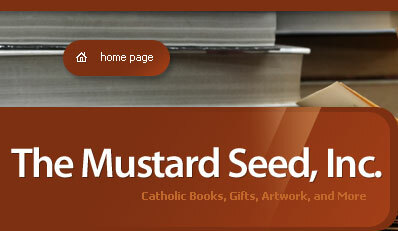 The Mustard Seed also offers a Reference Library of Catholic Classics. We strive to instill and strengthen the Catholic Faith as guarded by the Holy Father and the Magisterium of the Church. All proceeds go toward the pursuit of this goal. Eastertide is the time of new life. Our Savior's in the first place, living for ever a life which belongs no more to the earth and which one day we shall share with Him in heaven. And then our own lives -- from Christ to us -- for we have more than the assurance of rejoining Him; snatched by Him from the power of the devil we belong to Him as His by right of conquest and we share His life. The Fifty days from Easter Sunday to Pentecost are celebrated in joyful exultation as one feast day, or better as one "great Sunday." These above all others are the days for the singing of the Alleluia. On the fortieth day after Easter, the Ascension is celebrated, except in places where, not being a holy day of obligation, it has been transferred to the Seventh Sunday of Easter. This solemnity directs our attention to Christ, who ascended into heaven before the eyes of his disciples, who is now seated at the right hand of the Father, invested with royal power, who is there to prepare a place for us in the kingdom of heaven; and who is destined to come again at the end of time. The weekdays after the Ascension until the Saturday before Pentecost inclusive are a preparation for the coming of the Holy Spirit, the Paraclete. This sacred season of fifty days comes to an end on Pentecost Sunday, which commemorates the giving of the Holy Spirit to the apostles, the beginnings of the Church and its mission to every tongue and people and nation.